I guess it’s time we kick it into full gear and discuss homemade holiday gifts! I’m trying to get my head in the game…but I’m still mustering up the energy to out my fridge of Thanksgiving remnants. When it comes to holiday gift giving, I like going with treats that are a little bit different. I prefer to make treats that will standout in a crowd of holiday tins filled with chocolate dipped Ritz crackers (totally amazing btw). 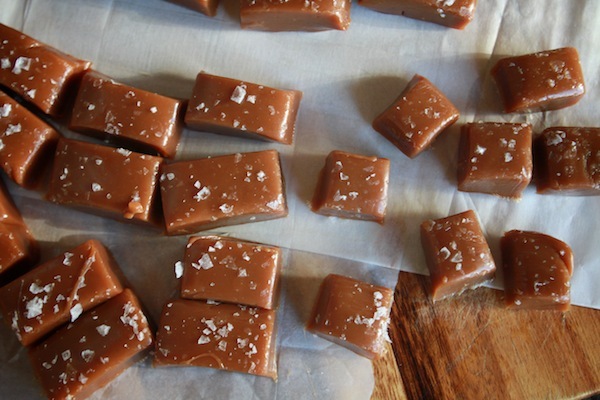 These Bourbon Salted Caramels are sure to do the trick. They’re salty with the faintest hint of bourbon…so that’s kind of palate cleansing, right? 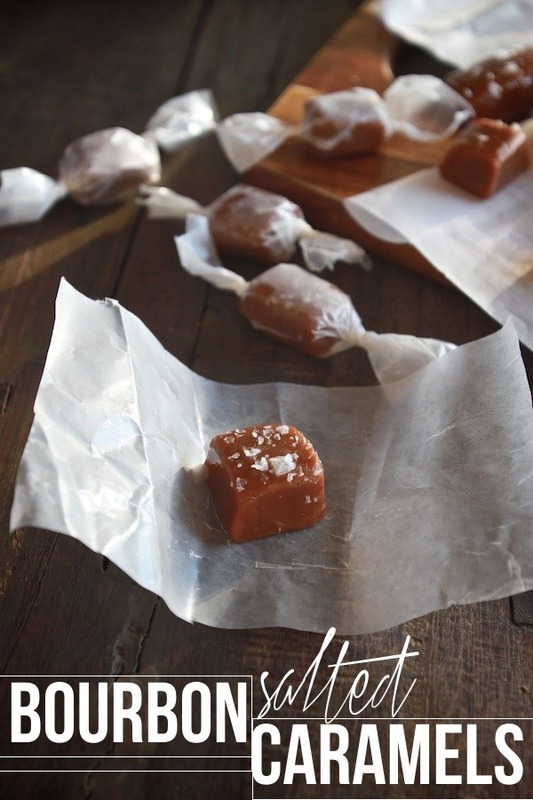 In these caramels the bourbon and the sweetened condensed milk round out the flavor and give it a little more depth. Less butter notes, more grown up flavors! What I love about caramel making is that it really takes the littlest amount of ingredients, with a bit of patience and some good crafting skills (hello wrapping candies!) and you’re good to go! 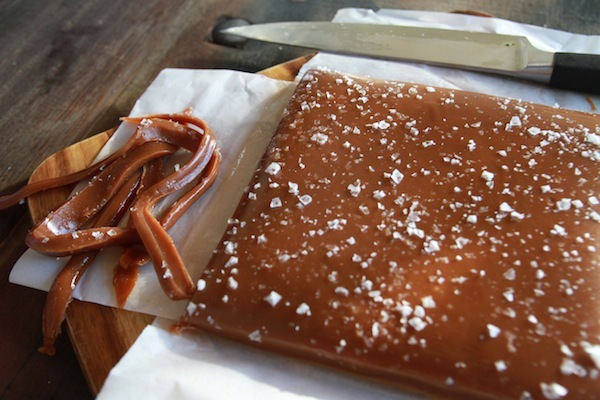 If you’re anything like me you’ll daydream about opening up your own salted caramel candy shop while you’re wrapping each delicious caramel square. Sweet/Salty/Booze/YES/PLEASE. Ingredient gathering. Not many ingredients, huh? Love that. First things first. 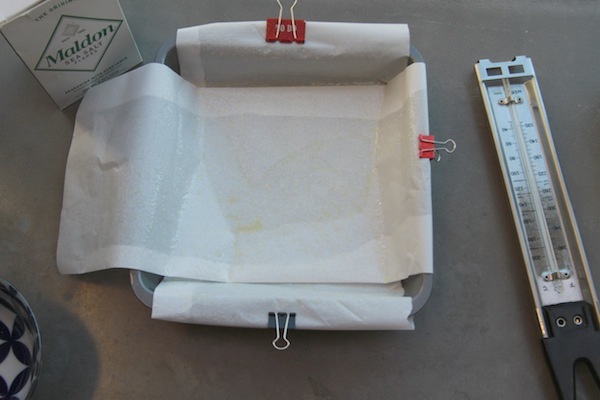 You need to add parchment to an 8 x 8 baking pan. I secured the edges with binder clips. I only had three…which means I need to seriously clean out my junk drawer. Get your butter cut up into pieces. 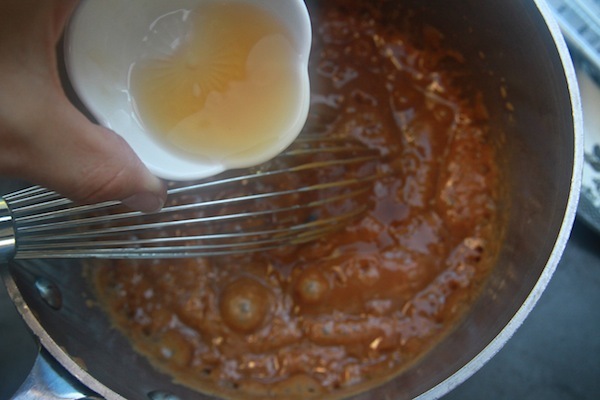 We want to prep as much as possible because caramel is FAST. Let’s begin. Water, sugar & corn syrup go into a medium saucepan. You’re gonna cook it until it turns a dark amber color. The recipe says it takes 8-10 minutes. It took a little bit longer for me. No bigs! Next step is adding the butter & sweetened condensed milk. Caramel coming along. Add in the condensed milk. Pop in your candy thermometer. We need to get it to 240F. Once it’s at the right temp (look at the color!) we stir in the salt & bourbon. Pour into your prepared pan! Now we bring in the big guns!! 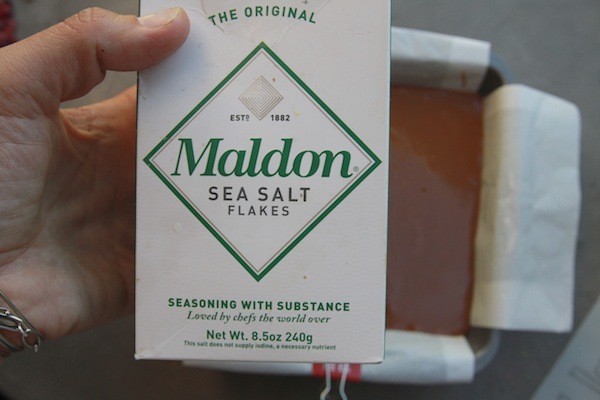 Maldon Sea Salt Flakes! They are AMAZING. It’s AMAZING on avocado toast. Just saying…. Oh and BREAD WITH BUTTER. Unnngh. OK. Now that the caramel has cooled, we are ready to cut! Trim the edges…which means EAT THE EDGES. I decided to wrap mine up in waxed paper because I ran out of parchment. Totally a good option! To make wrappers, cut the paper into 3 x5 sheets. Wrap them/twist them! They are deeeeeeeeeee-lish. Add more salt if you feel so inclined. This batch makes SO MANY! Get your caramel on! Lightly coat a 8 x 8″ baking pan with nonstick spray and line with parchment paper, leaving a 2″ overhang on 2 sides; spray parchment. 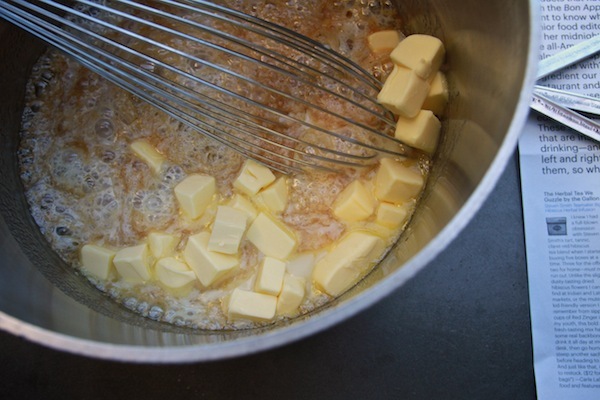 Remove pan from heat and whisk in sweetened condensed milk and butter (mixture will bubble vigorously) until smooth. 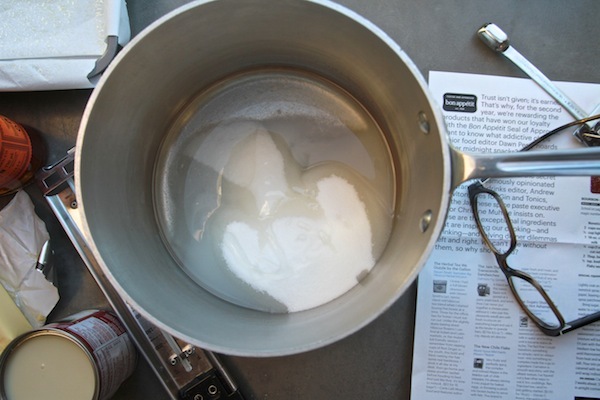 Fit pan with candy thermometer and return to medium-low heat. 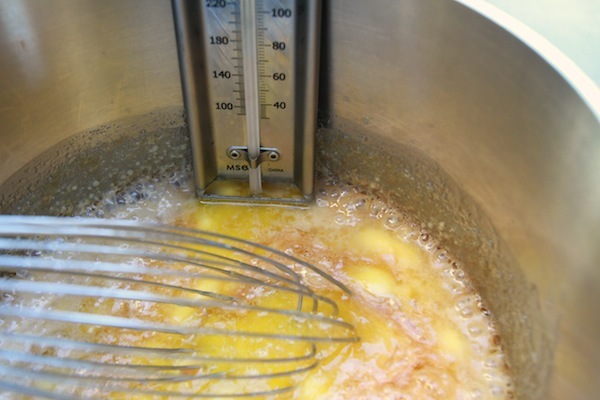 Cook, whisking constantly, until thermometer registers 240F. Remove from heat and whisk in the bourbon and kosher salt. Pour into prepared pan; let cool. 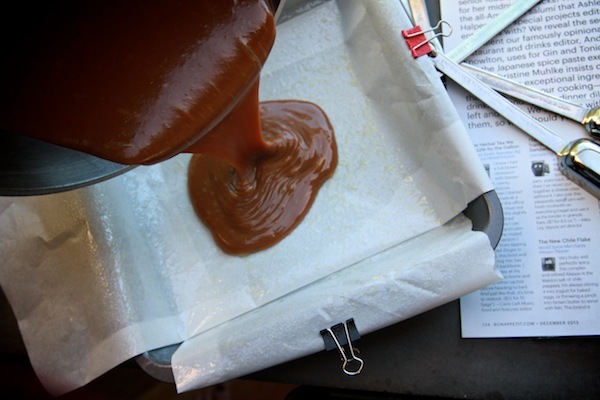 Sprinkle caramel with sea salt, cut into 1 inch pieces and wrap individually in parchment paper. 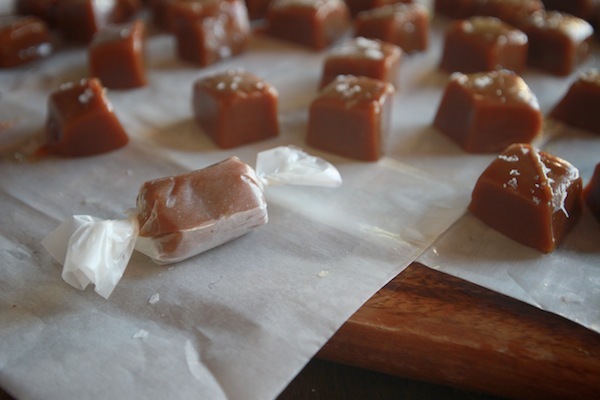 Caramels can be made up to 2 weeks ahead. Store wrapped tightly in plastic in an airtight container at room temperature. I have mine in the fridge. UNGH. So good. And that salt? It’s the best. I’m now craving avocado toast, and salted bourbon caramels. These look AMAZE! 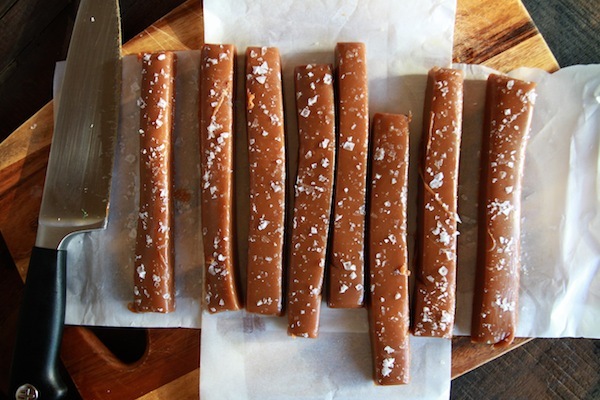 There’s nothing better than salt and caramel. Will have to look around for these salt flakes! Sweeeet! The hit of any party fer sure! Can’t wait to try the recipe. I actually did not have a candy thermometer, just a turkey one and it worked great! I counted between 180-190 then counted up from there 🙂 My first attempt and it was a SUCCESS!! These are amazing!! This is probably sacrilege, Tracy, but do you think it would work to substitute like a T of vanilla for the bourbon? My friends aren’t very boozy, but I LOVE the recipe other than that. Also…any thoughts on how well these would hold up in the mail to a cold climate? These just made my list of must-have holiday treats! Thanks! oooh! intrigued by the beer! OMG these look amazing. I will have to give these to myself. These look amazing … so amazing that they might make their way into gift bags at my annual holiday party! Thank you for sharing. If they are wrapped individually, will they last longer than two weeks? It has been forever since I last made homemade caramels. There’s no time like the present, especially since we are entering the holiday season. Love that you added bourbon to these! Those look incredible. I think I’m going to make these for people in my office, but I don’t have a candy thermometer. Can you recommend one? I am SO making these for Christmas. If only to eat the trimmed edges! YAY! I dog-eared this, as salted caramels are on my to-do list this year, and knew that BA wouldn’t disappoint… but knowing you love them has convinced me! I’m gonna make em this week! I knew the second I saw these in Bon Appetit that I wanted to make these. Gorgeous! These sound like the best possible idea of holiday giving. Bourbon, salt, and lovely chewy caramel–what’s not to love? I made these on the weekend! Then I stuffed them inside browned butter bourbon spice cookie dough and baked them. 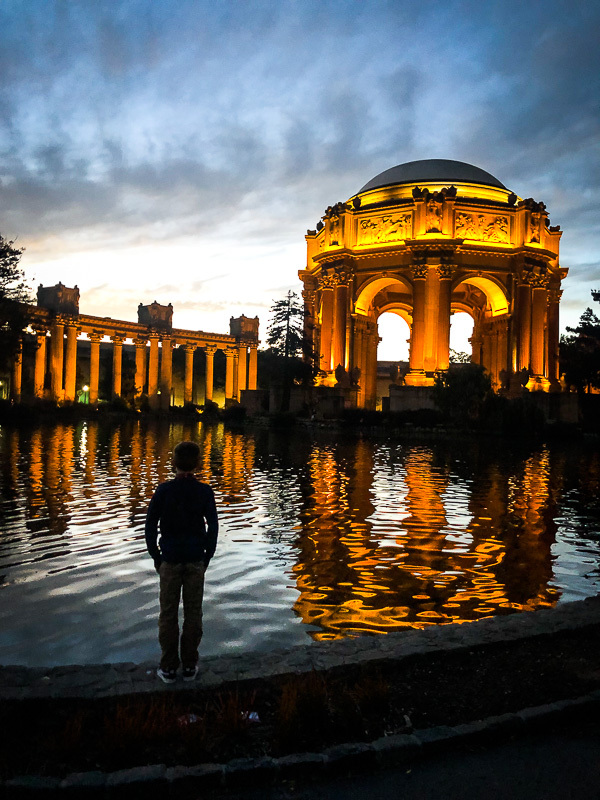 ummmm….AMAZING! These look so yummy AND pretty easy – what a great idea for a holiday gift! This is when I know I need to get a candy thermometer. bourbon all day every day. you make these look so easy! These look amazing! I am doing a lot of homemade gifts this year too 🙂 Granola and candies were on the list (it’s all about balance, right?). So simple, I love it! I will totally make these as gifts, thank you. They look super chewy uuuuuuuugggggh so good. Maldon sea flakes on everything ever! these are my weakness. add the booze and you have sold me! Tracy! Yum! 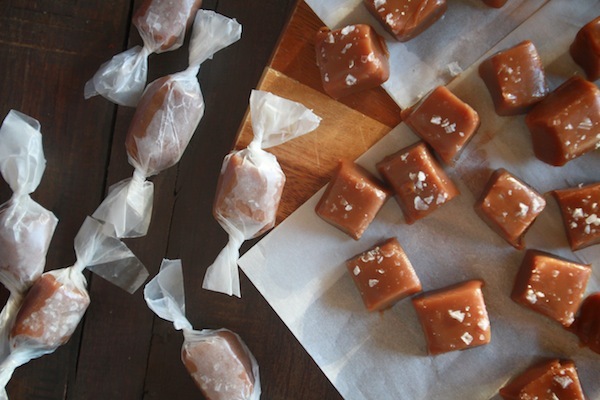 I am in love with the apple cider caramels from smitten kitchen but maybe it’s time to branch out. yes. thank you. FIXING IT NOW CUZ OMG. Wow! 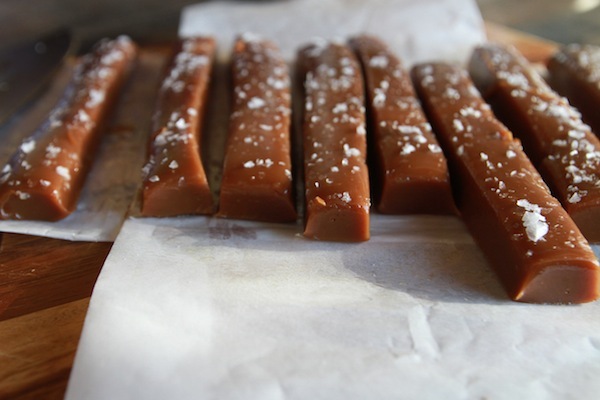 Usually caramel is not my go-to candy, but your little bourbon, salty treats look fantastic! 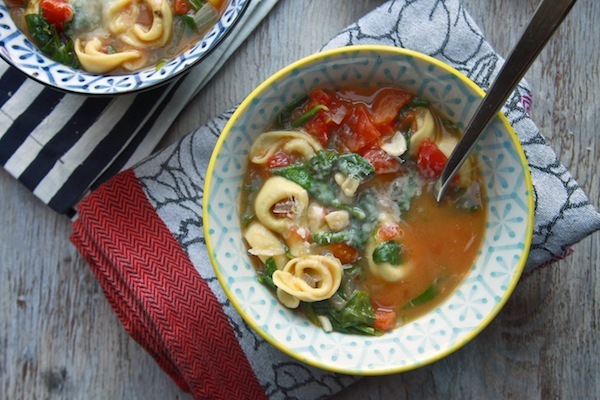 I love that the recipe makes a tons, always great motivation! Tracy, do you know a substitute for corn syrup? I live in the UK. 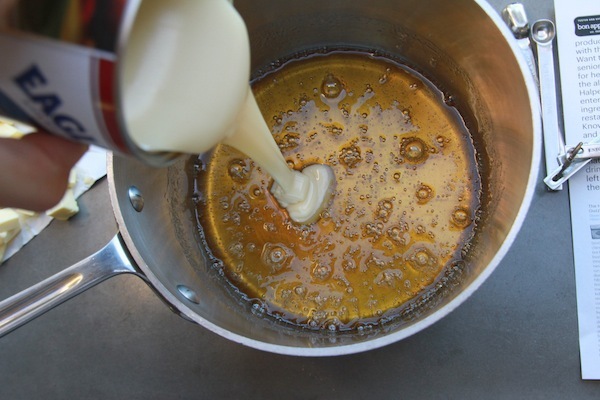 Do you know if golden syrup will work? I brought these to a party last night and they were a major hit! Thanks for the recipe!! Oh my my, these look delicious. I have been searching for a treat to bring for christmas with the fam. this might be it! YEAH GIRL. That sprinkled salt is so pretty! I made these last night and I’m excited to get home to cut and wrap. I’m lazy though, so instead of wrapping all of them individually I’m going to use some to make the Pioneer Woman’s pretzel turtles. Two variations on one candy! oh, and now that I have pretzels I’ll use those to make your white chocolate peppermint pretzels, Tracy! …..and THEN I’ll use the leftover candy canes to make…it’s never gonna end. So pretty! And I’m all about the bourbon. These look amazing and I love the way you wrapped them up in parchment paper. Makes for a great hostess gift for the holidays! Love this…going to make these for Christmas! Thanks for posting and the witty commentary. These are amazing! Made them as holiday gifts for neighbors and for valet and front desk staff in my building and they were a big hit. Thanks for helping me to be brave enough to attempt (and succeed at) making candy. Cheers! I made these last night and they are so delicious. My only question is, how soft are these supposed to be? Mine were pretty soft, even after cooling for a long time. I froze them for a little bit and then covered them in chocolate, which turned out great! But, how can I get them to be a little bit more firm? Any ideas? I would cook them for a little bit longer. I also have kept mine in the fridge this week. If they have a little chill on them, they’re obviously harder. What brand of butter do you use? 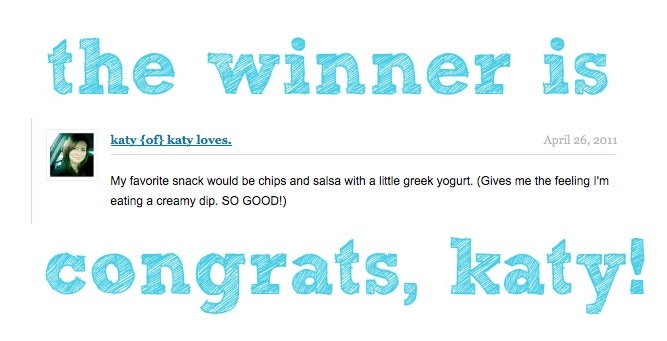 I was thinking or using Kerrygold. i made these last night, and they were perfect for the party. however, this morning, i noticed the texture had turned grainy. any thoughts on why this would happen overnight when the texture was so great the night before?? Bizarre! How did you store them? So – I stored mine at room temp and they became grainy. But i sent a bunch home with a friend who kept hers in the fridge, and she said they’re still great! 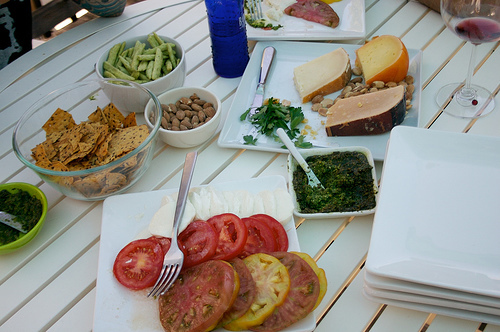 Lesson learned – store in the fridge! I made these this week. Rave reviews all around. The only thing is I’d say I really don’t taste the bourbon, but they are still delicious. 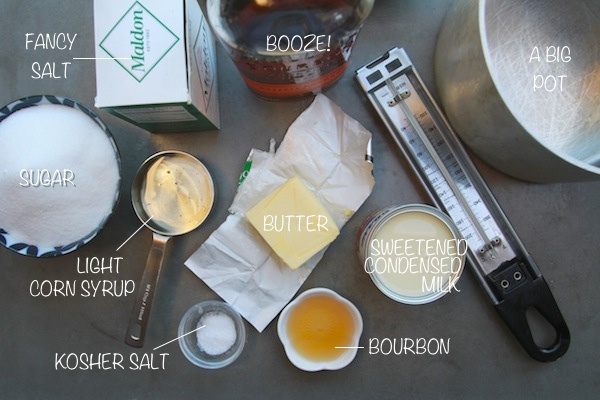 I think I will experiment with adding an additional Tablespoon of bourbon when I make them again next week. (They were so popular, I’m going to give them out as Christmas presents.) 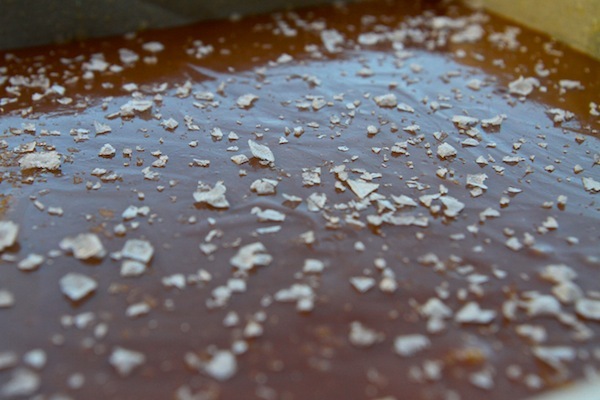 One thing to note – I followed the recipe exactly, and when I went to cut them, they were hard – almost like toffee. After doing some research online, I decided to melt the batch down on low heat and add some water (almost a half cup) before pouring it all out into the pan again. The texture ended up being exactly right. Oh wow! They were pretty soft when I cut mine. Did you overcook the caramel? The bourbon taste is subtle- but I wonder if you cooked alcohol taste off? Just made my first batch — you were right, they’re easy! I’ve always wanted to try making caramel. Everyone says it easy, but I think having the photo guide gave me the confidence to try it. I did replace one of the tablespoons of hootch with vanilla since I was worried it might be too boozy for a wimp like me. I think they’ll be awesome — I tried some pan scraps. Thanks Tracy! Yum! I made these for holiday gifts two nights ago. They were way too soft the first time around (due to my impatience). I reheated the batch to 250F, added a little more bourbon, and they turned out perfectly! I love caramels, but I’ve always been a disaster making them. HOWEVER, this recipe makes me feel like I should try again because the combo of sea salt, bourbon and caramel sounds out-of-control wonderful. Thanks for sharing, Tracy! I would love to make these but I don’t have a candy thermometer. Any suggestions on how I can work around that? Can I use other things instead of bourbon? Amaretto? Vanilla extract? You should really get yourself one! You can always eyeball when a caramel is done, but there’s such a fine line! You can definitely sub in vanilla or amaretto. It’s really about the amount– too much liquid and you can mess with it setting. Good luck! I clicked the link of the one you bought from Amazon. $9.99 is not bad. I always thought they were more expensive so I never bothered getting one but at that price I may just bite the bullet! I like these so much I made myself a batch the other night. I did figure out that my knife has to be really sharp and the caramels need to be really, really cooled in order not to fight with them too much. I think they’re totally yummy and I treat myself to a few before (and after) a run. Hi! I just made these tonight and they’re amazing! I could see wanting more alcohol as the flavor is slight. I did also add some vanilla for extra flavor! 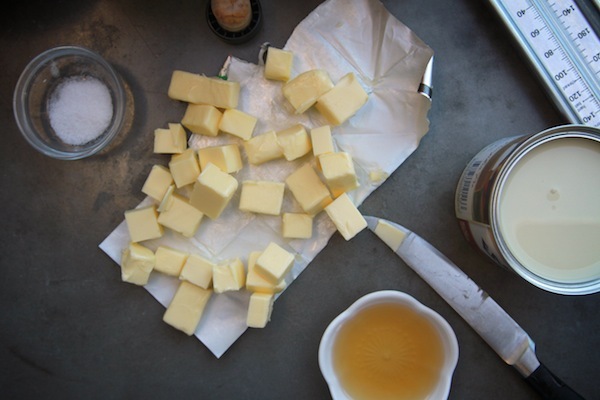 Butter adds texture and flavor. The caramels are buttery! 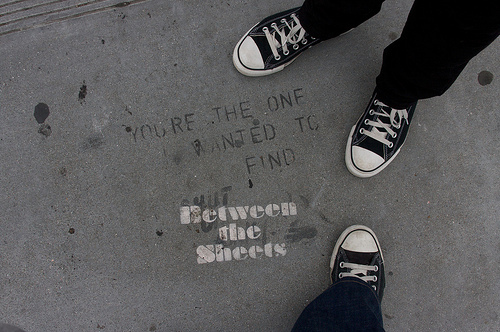 You’ll see. 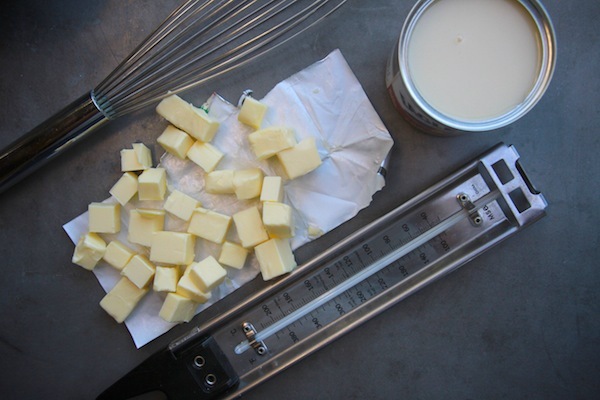 Is it possible to use heavy cream instead of sweetened condensed milk? I’m afraid they’ll end up being too sweet for me. I’m concerned that the proportions might need to adjusted then. Caramel can be fickle! 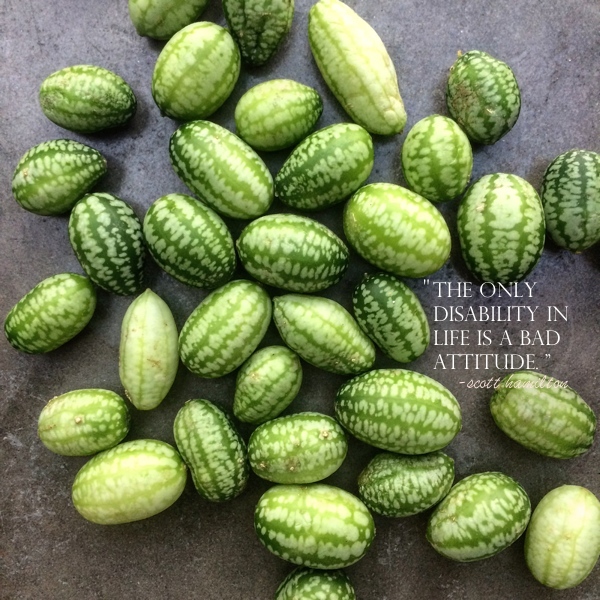 You should be able to! I’d make sure they were super cold when you do it so it’s easier to work with! so i have been racking my brain to find something for my male coworkers to make as a gift and this is IT! im gonna make it for real (not vegan) but wondering do you think earth balance will work instead of butter? Im going to still use condensed milk like it says, but if i buy butter i dont know what im going to do with the other three sticks since no one eats it in my house. 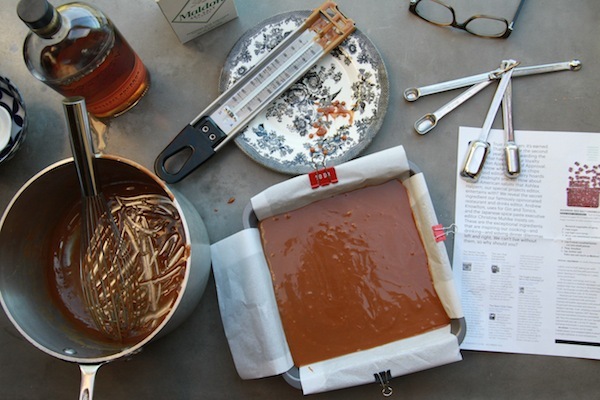 but i know caramels can be tricky so i dont want to mess with it…. I just tried these today. I was a little impatient because it smelled so good. I didn’t reach the proper temp. My caramels broke apart when cutting and tasted like really good caramel fudge. I trying not to eat it all right now. I will try again and next add more booze. I tried 1/2 vanilla and 1/2 bourbon. 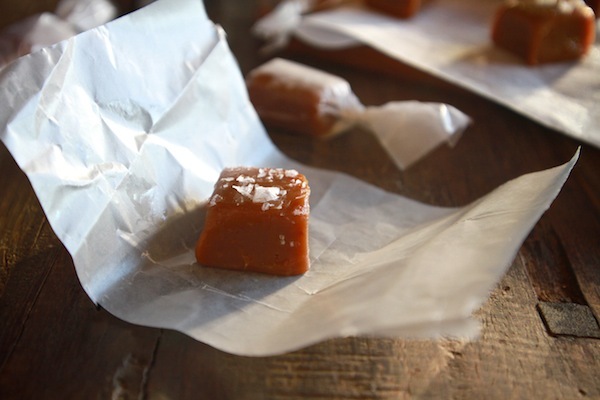 I have made hundreds of these caramels over the past year, and love every ones reaction when they eat one (or 6 or 7 ). I use different salts depending on my mood. 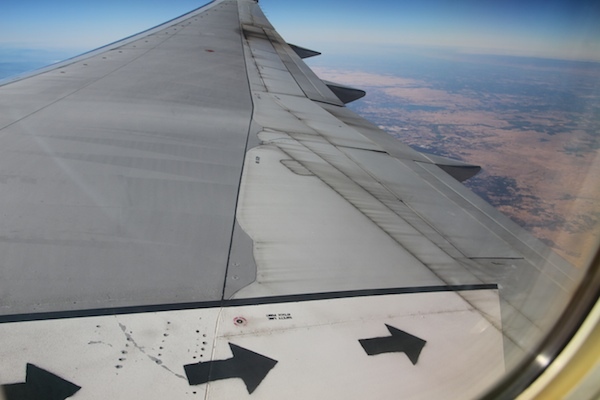 The one thing I have changed is the temp in the end… I find 146 holds a better shape, keeps and travels better too. My question is, if I were to finish it off without bringing to temp, would I have a lovely caramel sauce? I sure I have answered my own question by telling you about my temp change, but want to hear from an expert! I’ve made it about 5 times and I haven’t had a problem. Perhaps my candy thermometer is off? I followed recipe precisely (used stated amount of Makers Mark Bourbon). The caramels were great, but there was no hint of bourbon flavor. I’ve made caramels for years but this is the first time flavoring. Curious! I wonder if it cooked off? I wonder if you could add more without making the texture change? I made these, it didn’t come out good. Stuck to everything and hard to cut, but very tasty. Oh no! I wonder what went wrong? Does the alcohol cook out or can you get drunk off these? you can’t get drunk off of them. the alcohol cooks out. You did not “adapt” this recipe. This is the exact same recipe. At the most, all you did was reword a few of the instructions. I am glad that you updated that. I also saw a page post this recipe saying that they had adapted it from you and again it was ounce for ounce the same recipe.